After choosing the right rental applicant and running a tenant background check, the next step for landlords is to present the new tenant with an ironclad lease agreement. That’s why it is important to understand what it is that makes a strong lease. 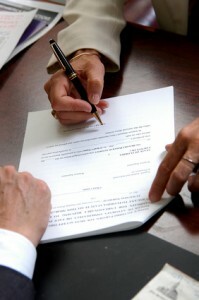 A lease agreement has to do double duty: it must be enforceable in court in case there is a dispute, but more importantly, a lease must reduce the chances of a landlord tenant dispute. The plainer the language, the more likely the lease provisions will be understood. If the lease is understood, there is a higher chance the tenant will abide by it. The more ‘heretofores’ and ‘whereins’ included in the lease, the more likely it is outdated, increasing the chances the tenant will ignore it. While there are legal phrases here and there that must be preserved, formal language or ‘legalese’ in general does little to bolster the effectiveness of a lease. In fact, the opposite may be true. The tenant has to feel that the lease is fair, or they will fight it — and the landlord — at every turn. That’s not to say the landlord has to give special concessions to every tenant, but even the simplest tweaks can make an otherwise unilateral lease more of an even exchange. Tenants keep score. Each concession on their part should be tied to a benefit. The more generic your lease, the less buy-in you’ll earn from the tenant. Personalize the lease agreement, even if you use a form lease. Don’t settle for calling your new renter “Tenant” and leaving it at that. Put the tenants’ names in (correctly! ), fill in all the blanks or insert “n/a”, type in the tenant’s name at the signature line — all this customization makes the lease seem more real and representative of the commitment the tenant is making. Let’s face it — we all have short attention spans, especially when it comes to reading legal documents. Prioritize the provisions in the lease so that the most controversial or important items are at the top. The last few terms should just be housekeeping — what lawyers refer to as the “boilerplate” provisions. Don’t try to hide a term in the fine print because the tenant will miss it, or forget it’s there. Remember, the goal is compliance. Be sure to sync the main body of the lease agreement — the pages that bear the title, with all the various attachments, exhibits and addenda. One way to do that is to mention each add-on by name in the main body. Alternatively, each page could be numbered ___ of ___ so that it is clear what is intended to be included in the lease package. The beauty of this strategy is that it accomplishes two goals at once. By making the lease user-friendly, the likelihood of a tenant dispute is reduced. At the same time, if a dispute does occur, a judge will apply these same factors — clarity of language, overall fairness, and whether the document is complete, in deciding whether to side with the landlord. Good article Chris, thank you. I just want to touch on the ADDENDA aspect of a lease. Some landlords obtain a generic lease and they don’t bother changing anything in it that would stipulate their criteria. Add Ons are just that, items that aren’t mentioned in the body of the lease and which you wish to add. Make sure that the prospective tenant signs or initials the Add On and you sign or initial as well. DO NO take anything for granted…if you want a tenant to be fully aware of your criteria, then spell it out in the lease agreement. Property Managers do this and experienced landlords do this. Recently I was approached after a presentation by a landlord who didn’t have Add Ons in the lease regarding his criteria, and to make matters worse, was lax in his inspections. Actually he never did one. So|I got the $20,000.00 question. What do I do now? Have a proper tenant screening process in place, have a lease agreement that clearly lists your criteria, conduct periodic site inspections, know your tenancy laws that include “how to evict a tenant.” And you should be OK.